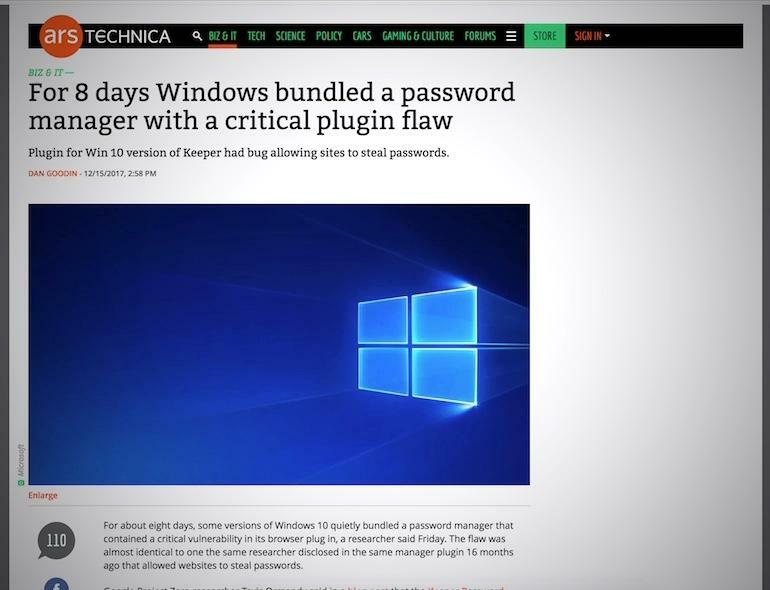 On December 15, Ars Technica ran a story by veteran security reporter Dan Goodin in which Goodin reported on a disclosure by Google researcher Tavis Ormandy, who had discovered that Keeper Security's password manager, bundled with Windows 10, was vulnerable to a password stealing bug that was very similar to a bug that had been published more than a year before. Ormandy had reported the bug to Keeper Security in advance of publication and waited until the company had issued a patch to disclose it. Keeper Security has filed a lawsuit in Illinois (where it is based) against Goodin and Ars Technica, alleging that the factual report of the defects in its products "made false and misleading statements about the Keeper software application suggesting that it had a 16-month old bug that allowed sites to steal user passwords." Keeper Security previously threatened to sue Fox IT, a security research firm, over publication of another defect in its products. Illinois has good anti-SLAPP laws, which protect critical speech from legal attacks that try to outspend critics, which bodes well for Ars and Goodin. In the meantime, the lawsuit has attracted critical attention to Keeper Security, as security journalists and researchers speak out against "ridiculous" actions that are tantamount to "bullying."